The Hartland Chamber of Commerce welcomed a new member recently. 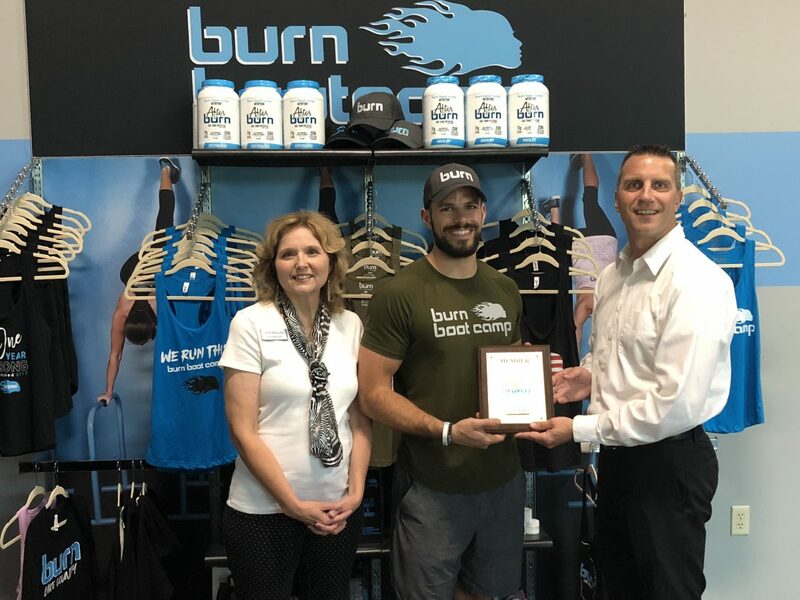 Ambassador/Board Member Matt Gaulke of Great Midwest Bank (right) presented Brandon Hamilton of Burn Boot Camp – Lake Country, WI with a membership plaque from the Chamber. Also pictured is Chamber Ambassador/Board Member Deb Nollen of Area Welcome and a Mary Kay Beauty Consultant. Burn Boot Camp is a lifestyle fitness facility designed to inspire, empower, and transform the lives of busy women and their families. They provide a mindset and positive environment for women to encourage and motivate one another to get better every day. Their clients experience a high-energy 45-minute session that is progressively challenging and never the same. Their free childcare allows moms to focus on themselves so they can make their families better. Burn Boot Camp – Lake Country is located at W248 N5250 Executive Drive, #200, Sussex and can be reached at (262) 955-5575. Visit www.burnbootcamp.com/lake-country-wi/ for more information.